Fiddle and guitar duo playing Irish, American, Swedish and Eastern European traditional music. 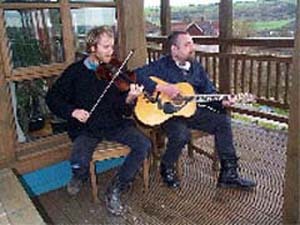 Playing energetic and beautiful Swedish, Irish, Klezmer and American traditional music (and more), Ben Paley (fiddle) and Tab Hunter (guitar) have worked with Damon Albarn, Channel 4 and the Levellers among others. Their CD ‘Dolor Ipse’ was called a “Virtuoso album” by Folk Roots and “The definitive CD” by Folk London. Ben Paley & Tab Hunter have been playing together for long enough to know better, first in Brighton scratch-band the Aardvarks, later with the infamous bluegrass-rockers The Wild Turkey Brothers (who toured in support of The Levellers and Chumbawumba). Their duo work includes the launch of ‘Evolving Traditions 2’, Mrs Casey Music’s compilation of the best of young British folk musicians at the Barbican; working with Damon Albarn and Michael Nyman on the music for the Fox feature film ‘Ravenous’, and supplying incidental music for Channel 4’s ‘Grand Designs’. They impressed audiences at the second Fulbeck International Fiddle Festival with sensitive interpretations of traditional tunes from the British Isles, Europe and America: their range of material reflects their shared love of all traditional music and they play Irish, American, Swedish and Eastern-European tunes with equal measures of passion, skill and authenticity. Ben (described by Folk Roots as “just about the best folk-fiddler of his generation”) has been playing the fiddle music of the USA, Sweden and Ireland since he was six years old. He has toured widely with his father Tom (founder-member of the seminal New Lost City Ramblers) and recorded with Bing Lyle, Mandragora, The Saw Doctors, Murray Lachlan Young and The New Deal String Band. His collection of Swedish fiddle tunes (‘Swedish Fiddle Music, an Anthology’ published by Dragonfly Music) has become the standard work on the subject in this country. Tab has gained his breadth of experience as a guitarist (flat-picker and accompanist), songwriter and recorded jews’ harpist as a soloist and in duos and bands in the tradition, from Irish music to death-blue-metal-grass, through klezmer, jazz, Old Time and Scandinavian folk music. His playing has taken him to perform all over Europe, including England’s prestigious Edale and North Wales bluegrass festivals. He has appeared on television and on BBC Radio.